Revolutions take many forms, but those that begin with anger and frustration diffused across a population can appear slow in the making, if only because what is visibly broad does not always show itself as deep and powerful. So it must have felt on those chilly Saturday nights on Seoul’s streets last October, when people first gathered in protest. Outraged by growing evidence of corruption and abuse of authority by President Park Geun-hye, at first thousands, then tens and hundreds of thousands, and finally more than a million gathered in candlelight vigils calling for an end to her rule. Only as autumn turned to winter did the end come: Park was impeached, then in March was removed from office. But as Albert Camus said in The Rebel: An Essay on Man in Revolt, when a slave rises up against his master, it is not against the last lash of the whip, but all those that came before. Moon Jae-in, elected as South Korea’s new president on May 9, inherits leadership of a country whose citizens have challenged the foundations of its democracy and how the political system and economy have been managed for decades. They clamor for change and a re-legitimization of its democracy. 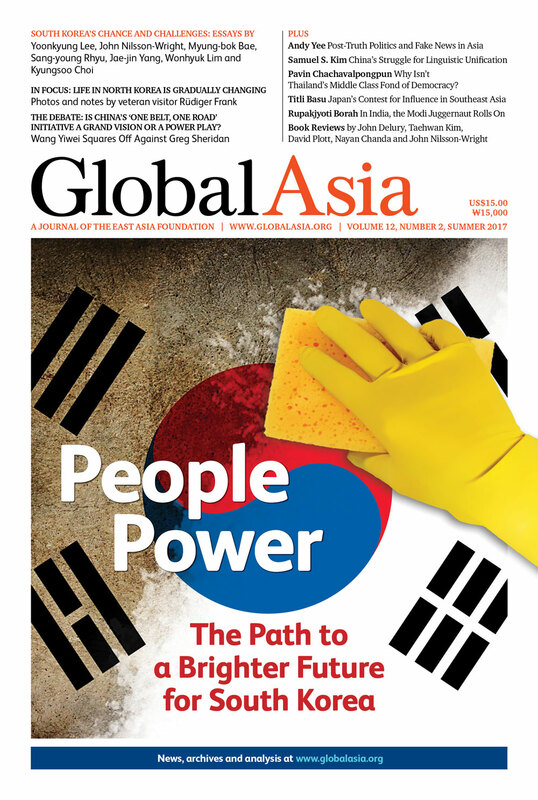 In our cover package, we examine the huge challenges that this People Power Revolution has laid before the feet of Moon and future South Korean leaders. To be sure, many have been a part of political debate for decades. But the stakes are higher now, and the public — freshly aware of its newfound power — is demanding accountability. The challenges include finally amending the constitution to end South Korea’s “imperial presidency;” reforming a system that affords chaebol, or family-owned business groups, control of much of the economy; expanding a welfare system that does too little to protect the needy; addressing widening income gaps and other social inequalities; adopting policies to help South Korea harness the Fourth Industrial Revolution, ushered in by growing use of AI and robotics; grappling with youth unemployment in a country also burdened by an aging population; and managing complex relations with China, the US and Japan, amid continuing provocations from North Korea. If the challenges are daunting, one can take comfort in the fact that South Koreans have overcome worse before. From the rubble of the Korean War, they built a major global economy in just 30 years. In the People Power Revolution that toppled Park, they signaled that they can still surprise. Elsewhere in this issue, we feature a debate on China’s ambitious “One Belt, One Road” initiative. Is it a grand vision or an illusion? In our Features section, we explore the unique challenges that a rising China faces in unifying the language that it hopes will bind the nation together. We examine the scourge of “fake news” in Asia and why it matters; why Thailand’s middle class has become an obstacle to democracy in the face of the growing ambitions of the country’s rural population; how Southeast Asia has become a central focus of Japanese policy-makers under Shinzo Abe; and the unexpected impact of Narendra Modi on India’s foreign policy. Our In Focus section features a first-hand account of the latest trip to North Korea by long-time visitor Rüdiger Frank and the changes he has observed over the years. Finally, in our book review section, we focus on a work that tries to explain America’s long-term strategy for the Asia-Pacific, in addition to our usual banquet of short reviews of books on this region. The People Power Revolution that toppled former South Korean President Park Geun-hye was historic and unprecedented. Among other things, it represented a visceral call by the public for clean government and an accountable democracy. The tasks now facing newly elected President Moon Jae-in are daunting and urgent. It will take wisdom and creativity within a fractured political system to restore a sense of national harmony. The new government must understand how the conservatives came undone and institutionalize the democratic spirit of the candlelight vigils that brought it to power. Dramatic policy challenges await the new government from radical, technology-driven changes to the workplace. South Korean President Moon Jae-in’s inauguration address on May 10, 2017. President Moon Jae-in must balance Pyongyang, domestic political constituencies and the foreign-policy goals of China, the US and Japan. One of South Korea’s central challenges is an old one: whether and how to amend its 1987 constitution. Major strides on this important social agenda are unlikely because of a reluctance to press for tax increases. A lack of youth job creation is a nagging issue. Recovery will require short-term consumption growth. China’s ‘One Belt, One Road’ Initiative: A Grand Vision or a Play for Power? China's Belt and Road Initiative has the potential to deepen connections within Asia and between Asia and the rest of the world in ways that will promote shared prosperity. The initiative certainly has a lot to recommend it, not least its promise of infrastructure spending. But it also has financial and geo-strategic motives to enhance China's influence. Beijing’s growing geopolitical influence and willingness to fund regional projects make Southeast Asia a focal point for a contest of influence with Tokyo. Few non-Chinese are even aware of the country’s long struggle to forge its national language, something taken for granted in Western and other nations. Why Isn’t Thailand’s Middle Class Fond of Democracy? The country’s Bangkok-based middle class and civil society are intent on preserving their political interests at the expense of the rural population. Some of the greatest surprises have come from the prime minister’s numerous foreign policy moves, which have marked him out as a force to be reckoned with. North Korea may still flout human rights and continue to develop a nuclear arms arsenal, but life in the country is changing gradually. One veteran observer saw signs across Pyongyang during his most recent trip. By More than Providence: Grand Strategy and American Power in the Asia Pacific since 1783, by Michael J. Green. Stein Ringen responds to William H. Overholt’s review of his book The Perfect Dictatorship in our Spring 2017 issue. New titles by Anne-Marie Slaughter; Alexander Dukalskis; Basharat Peer; Patrick Kugiel; Paul Murphy; Toh Han Shih; Tuong Vu; Graham Allison; Stephen D. King; Frank Dikötter; Michael Lucken; Seung Hyok Lee.